If you’re like many people, your answer would be yes. And that’s a worrying sign. Because most marketers think video content is the future of online marketing. So if you’re not prepared to make videos a regular part of your content marketing strategy, you’re missing out on a huge marketing and branding opportunity, and might even become completely irrelevant in a few years. But we don’t want that to happen. 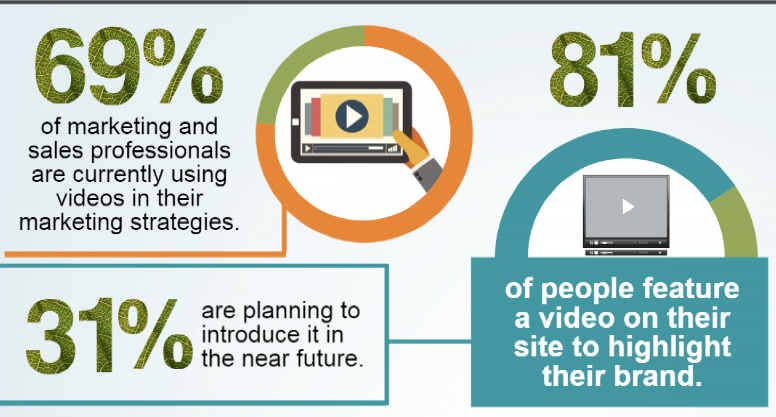 So here are a few ideas by Upward Media to help you integrate videos in your content strategy. You already know that producing high quality, in-depth and actionable content is necessary for creating a loyal subscriber base and improving your search rankings. Most of your competitors know it as well. In fact, many of them may even be creating such content. So how do you get ahead of them? 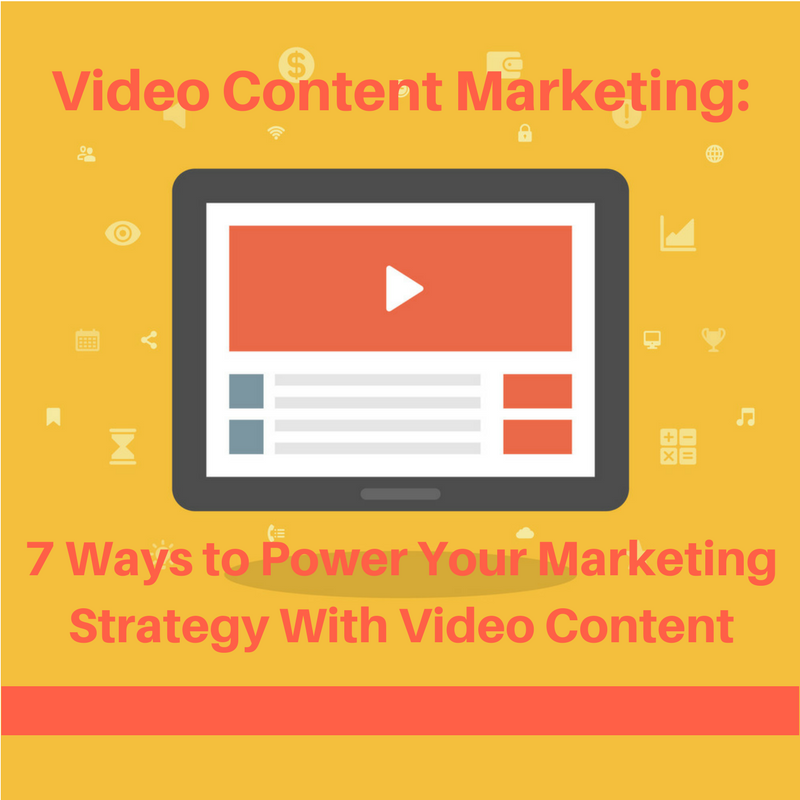 By adding videos to every piece of content you publish. A relevant video not only adds more variety to your content, but also keeps your readers engaged longer. For example, Bryan Harris, a leading marketing and blogger, regular adds videos to his posts. Studies show that adding a video to a page increases its probability of making it to Google’s first page by 53x. That’s because video has a direct impact on two key SEO metrics – time on site and bounce rate. When you embed a video in a blog post, the time your readers spend watching it on your site contributes to your average time on site metric. And when they stay longer, they’re likely to explore other content on your site as well which reduces the bounce rate. Improvement in both these metrics tells Google that your page is valuable for the readers. As a result, your rankings rise. So even if you can’t create your own original videos, find a relevant one from YouTube and embed it in your blog post. One of the key objectives of any content marketing activity is to get more people on your subscriber list who can be matured and converted into paying customers. Videos do a fantastic job at this. 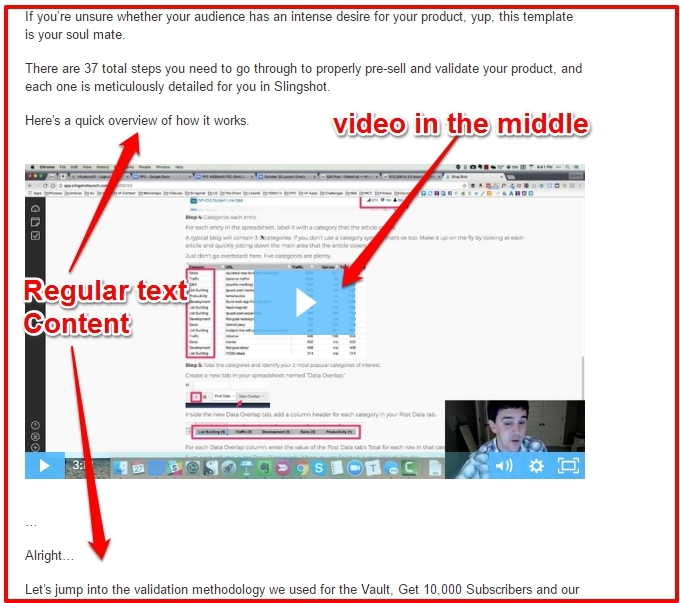 You can use video courses as lead magnets to get more subscribers on your landing pages. This works well because video courses have a much higher perceived value as compared to an email course or a PDF eBook. Or you could do a free webinar or Facebook Live video session, teach your audience something for free and then ask them to sign up to your list by offering a more comprehensive lead magnet like an eBook or a course. Videos are equally effective when you’re looking to generate leads from your sales landing pages. Peep Laja, a conversion specialist, saw a 45% increase in conversion rate when he added a video to his sales landing page. In short, videos do a fantastic job at convincing new visitors and complete strangers to sign up to your list and buy your products. Email marketing is among the most profitable online marketing channels. According to Email Monday, every $1 invested in email marketing has the potential to return you $38. A low open rate or CTR means your emails aren’t engaging your subscribers enough to make them take action. Once again, videos solve this problem better than any other content type. 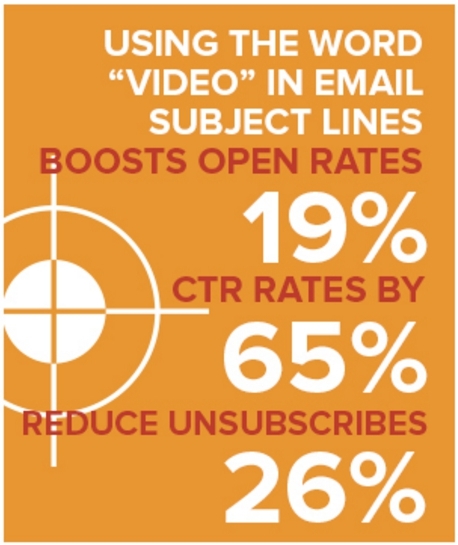 According to SyndaCast, just using the word “video” in your email subject line can increase open rates by 19%, increase CTR by 65% and reduce the unsubscribe rate by 26%. 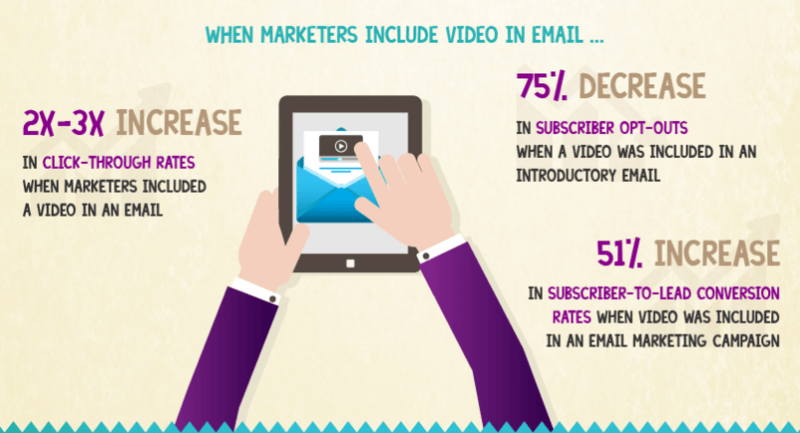 According to another study by QuickSprout, the CTR of your email campaigns increases by 200%-300% when you include a video in your emails. Videos won’t play in your email, of course. Instead, you’d need to use a snapshot of your video, place it in the email body, and link it to the URL of the video on YouTube or your own website. Looking your customers right in the eye, face to face and live – there’s no better way to build trust online. But as Facebook Live has proved over the last 2 years, if you leave your comfort zone, face the camera and talk to your audience live, the rewards are immense. There are other live streaming services as well, but the sheer size of Facebook’s user base makes it a much more tempting platform for marketers. Facebook currently has more than 1.86 billion monthly active users worldwide. According to certain estimates, Facebook Live videos get more than 10 billion daily views. Going live on Facebook regularly and sharing your knowledge directly with your audience makes you much more credible and trustworthy as compared to someone who shares text content only. Marketers are using live video streaming in several innovative ways. But one of our personal favorites is how some marketers create anticipation for their upcoming content with live streaming, recorded videos and webinars. For example, Kim Garst, a leading social media marketer, usually goes live on Facebook to discuss some of the content of her upcoming blog post. She’d share 2 or 3 really good tips from her new post that would get the audience interested, and then ask them to read the post on her blog for more. This simple technique works so well because of the interest generated by the video tips. An even smarter approach is to go live on Facebook or Periscope and discuss the topic of your upcoming post with your audience. But instead of just sharing tips and content, invite your audience to ask questions related to that topic. Encourage discussion, share tips and even ask questions to your audience. This approach has two benefits. It helps you engage with your audience on a regular basis and build a stronger relationship with them. It allows you to crowdsource new ideas for your content. Once you complete the live session you can list down all the questions your audience asked, and expand them into a complete blog post. You can even embed the recording of your live video when you publish the post. There’s an emerging trend among startups and even established brands of being transparent about their business operations. Companies like Buffer, Groove and Shopify have a history of sharing videos of their employee work spaces, office meetings and product development procedures. 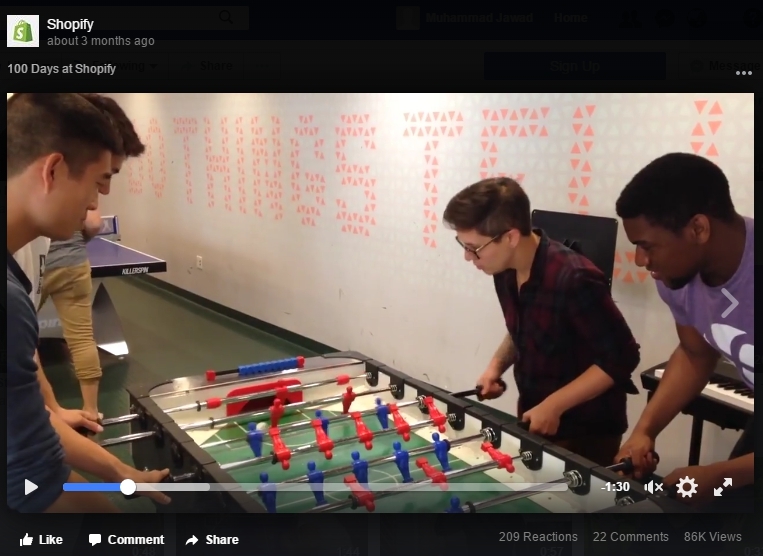 For example, this video on Shopify’s Facebook Page shares how Shopify employees have fun while working there. It has more than 85 thousand views. Taking your audience backstage and showing them how you work strengthens your brand image and makes you more trustworthy. There’s no doubt that the volume of video content on the web is only going to increase in the coming months and years. It may even replace text content completely. 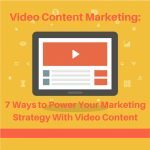 But even if that’s not the case, you still need to seriously consider making videos a part of your content marketing strategy and take advantage from this global marketing trend.